Georgia is in a region of the United States that exhibits no substantial long-term warming. 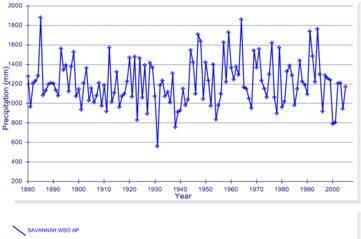 Recent warming is less than in the 1920s – 1930s. The following figure shows the temperature anomalies for 1860 to 2007 for the 30-35 N latitude x 80-85 W longitude grid from the HadCRU data used by the IPCC. This 5x5-degree grid contains Georgia and part of South Carolina (as well as very northern Florida). 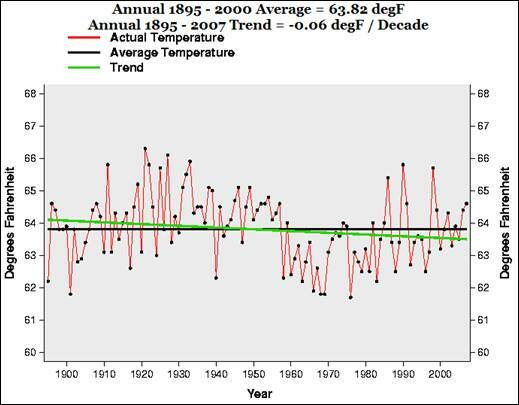 The following figure shows the Georgia average annual temperatures from 1895 to 2007 from the National Climatic Data Center [http://www.ncdc.noaa.gov/oa/climate/research/cag3/ga.html]. 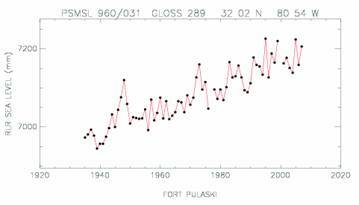 It shows a similar pattern to the HadCRU data shown above. 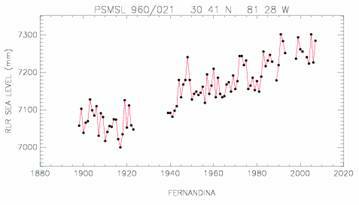 Although there has been some warming since 1970, it is still below the 1920s – 1930s. 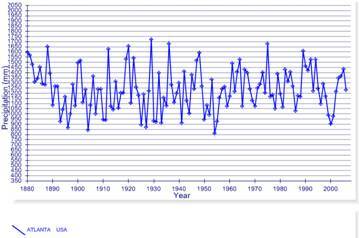 The following figure shows the annual mean temperatures from 1880 to 2007 for several of the long-term temperature stations in Georgia from the NOAA Global Historical Climate Network. Georgia is not exhibiting unprecedented warming. 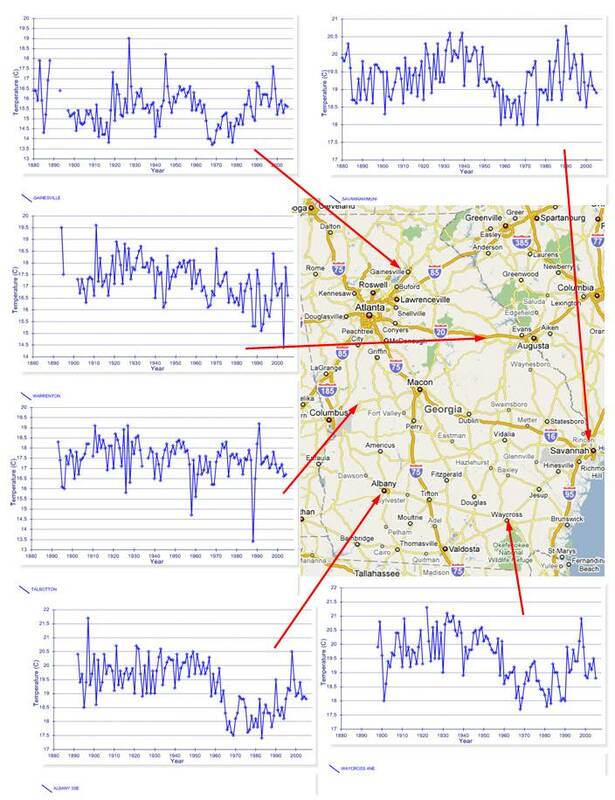 The following figures show total annual precipitation from 1880 to 2007 for a few locations in Georgia from the NOAA GHCN database. 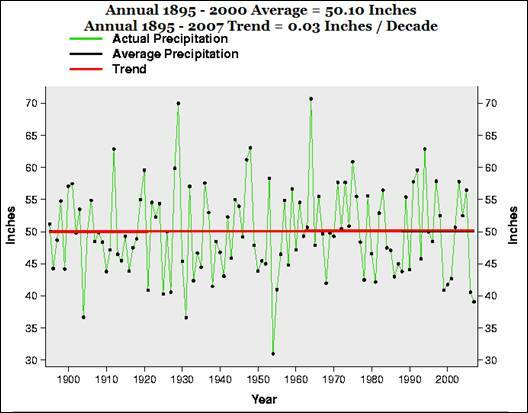 The following figure shows the Georgia total annual precipitation from 1895 to 2007 from the National Climatic Data Center [http://www.ncdc.noaa.gov/oa/climate/research/cag3/ga.html]. 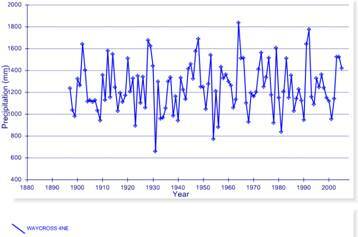 It shows low rainfall the last couple of years similar to the 1930s. The following figures show the only two historical sea level stations in Georgia [http://www.pol.ac.uk/psmsl/]. The sea level in this area of the continent has been rising at a rate of 2 mm per year at Fernandina (south end of Georgia’s coast) and 3 mm per year at Fort Pulaski (on the Savannah River). The rate of increase has actually slowed in the last few years. 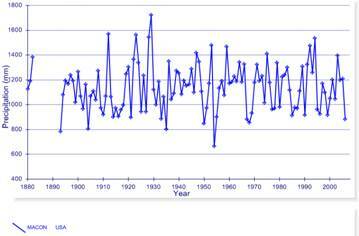 Given the problems with climate models and the fact that Georgia has had no warming over the last 100 years, the NCSL report is ridiculous. It contains many statements about what “might” happen – but the empirical data shows no need for alarm.